In today’s post we’re taking a look at some delightful Christmas decorations. Advent calendars, stockings and more; all created by our favourite greetings card and gift designers. If you’re a fan of self-gifting or like to treat your favourite friends and family to a few pre-Christmas gifts these festive decorations are for you. A set of beautifully designed, quality items that will decorate your home in style. Lavender Robin Decorations from The Black Rabbit, £11.50. 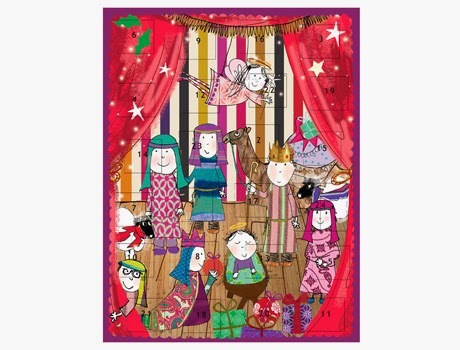 Nativity Advent Calendar from Caroline Gardner, £4.95. Paint Your Own Christmas Tree from Letterfest, £20.00. Gingerbread House Crackers from Nancy and Betty, £32.00. Stag Christmas Stocking from Sophie Allport, £12.00. Baby’s First Christmas Robin Decoration by Spaceform, £24.95. Robin Christmas Decoration from We Laugh Indoors, £5.00.